Heat oven to 350°F. Separate dough into 8 biscuits. Separate 2 biscuits into 3 layers each; add 1 layer to each of remaining 6 biscuits. In ungreased jumbo muffin pan, press each biscuit on bottom and up side of muffin cup. Microwave frozen vegetables as directed on bag. Pour vegetables into medium bowl; stir in tomatoes, tomato paste, salt and garlic. In small bowl, mix ricotta cheese, Parmesan cheese and 1/4 teaspoon of the parsley. Spoon 1 rounded tablespoon ricotta mixture into each biscuit. 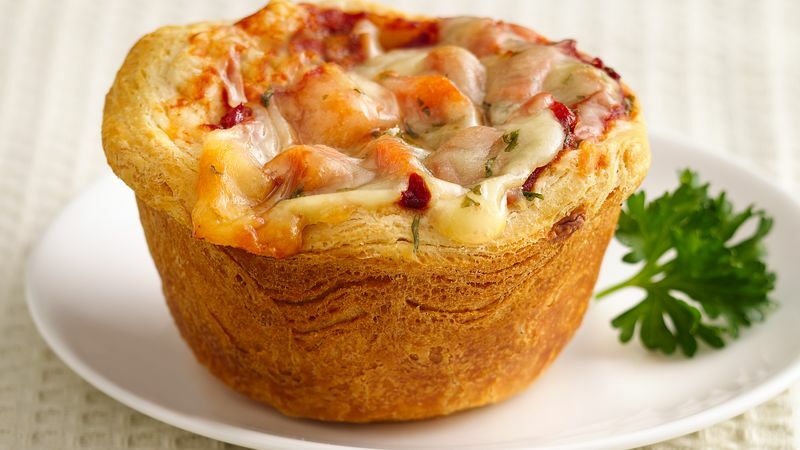 Top each with 1 tablespoon mozzarella cheese and rounded 1/4 cup vegetable mixture. Sprinkle with remaining mozzarella cheese and parsley. Bake 30 to 35 minutes or until biscuits are golden brown and filling is hot. Cool in pan 5 minutes. Carefully run knife around side of cups to loosen; remove from pan. Cool 10 minutes longer before serving. Serve warm.